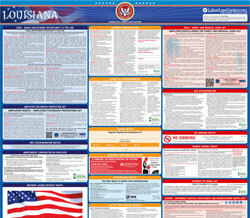 The Timely Payment of Wages is a general labor law poster poster by the Louisiana Office Of Human Resources. This is a mandatory posting for all employers in Louisiana, and businesses who fail to comply may be subject to fines or sanctions. This poster must be posted in a conspicuous place where all employees will see it. This poster describes the employer's duty to inform an employee when they are hired what their wage rate will be, how often they will get paid and how they will get paid, and that employees will be notified when this changes. This poster also informs employees where to contact should employers violate this law. It appears you don't have a PDF plugin for this browser. Please see the link below to download louisiana-timely-payment-of-wages-ltr-color.pdf. how often you will be paid and how you will be paid, and of any subsequent changes thereto. agreement, you must  ﬁ rst lodge a complaint with him.